Flying Business Class is the most common redemption Point Hacks readers aim for—and it’s the one we recommend the most. So, what can you actually expect from your first flight in Business Class? In this guide, I explore the experience from start to finish. Accompany me from priority check-in to relaxing in the lounge, enjoying fine dining and drifting into a comfortable sleep onboard your flight. Sorry for this false start—this benefit you’re unlikely to be able to take advantage of if you’ve used frequent flyer points to book your flight. This is more for those using cash. Eligible paying customers departing from Australia can get a free transfer to and from the airport with Emirates, Hainan Airlines, Air China and China Eastern. 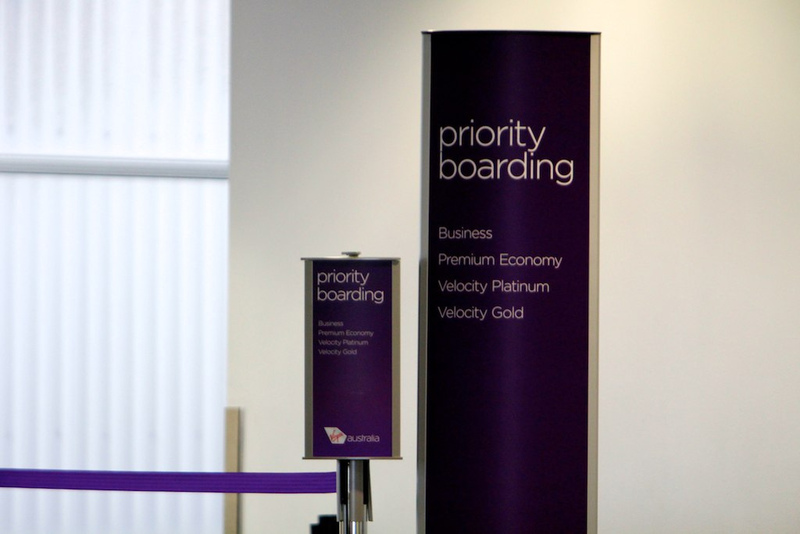 Virgin Australia passengers flying to Los Angeles are also included, as well as those flying Qantas to London. That includes travellers who have used Qantas Points to book their flight, however, they hardly ever release award seats on this route anyway. You shouldn’t have to wait in line for long (or at all). Business Class passengers, as well as those with elite status, usually have a separate line for check-in, denoted by a sign and often carpet (so plush!). During check-in, be sure to confirm the seat you have chosen. Technically, the check-in agent should advise you of the lounge/s you are eligible to access, but in my experience, this happens the minority of the time. Therefore, proactively ask which one/s you can go to. If you have time before you go to the airport, make you do your research so that you’re aware of the best lounge for your flight—it may not be the one the agent recommends. This can often be the most stressful part of your flying experience—waiting in line at security and immigration (if flying internationally). I’d say less than half the time Business Class passengers can get a special pass to whisk through security and immigration, so when you do, think of it as a bonus! Business Class passengers usually get access to a lounge before their flight (and sometimes upon arrival at the other end). Note that, strangely, lounge access is not granted to Business Class passengers on US domestic flights unless you have status—in Australia and most of the rest of the world, we’re much luckier. and then most Business Class lounges offer a buffet spread. À la carte dining—where you choose from a menu—is more commonly found in First Class lounges. However, some Business Class ones offer it, like The House Sydney and Melbourne for Etihad and Virgin Australia passengers. If you’re getting on a long flight, especially if you are in transit, you might appreciate freshening up with a shower, which are found in most Business Class lounges. Make sure to book in for a slot when you first arrive to the lounge. This one goes without saying: you’ll board after First Class (if that cabin is on your aircraft) but before everyone else (or you may choose to wait until the end). You probably won’t be greeted by name or ushered to your seat—that’s more for First Class passengers. However, there will probably be a cabin crew member nearby to help you with your carry on and hanging a coat if you have one. If the cabin crew doesn’t proactively offer you a tour of your seat, ask for one so that you are familiar with its features. You’ll receive a welcome drink, often accompanied by a small plate of nuts. Depending on the laws of the country you are departing from, alcohol may or may not be permitted to be served on the ground. The best airlines will have the purser (read: the boss of the cabin crew) come through to individually welcome you and give you a personalised flight briefing. This is the time to confirm any special meal requests or raise any concerns with delays and connecting flights. Another member of the cabin crew will most likely distribute menus and after giving you time to decide, will take your order for the meal/s to be served. 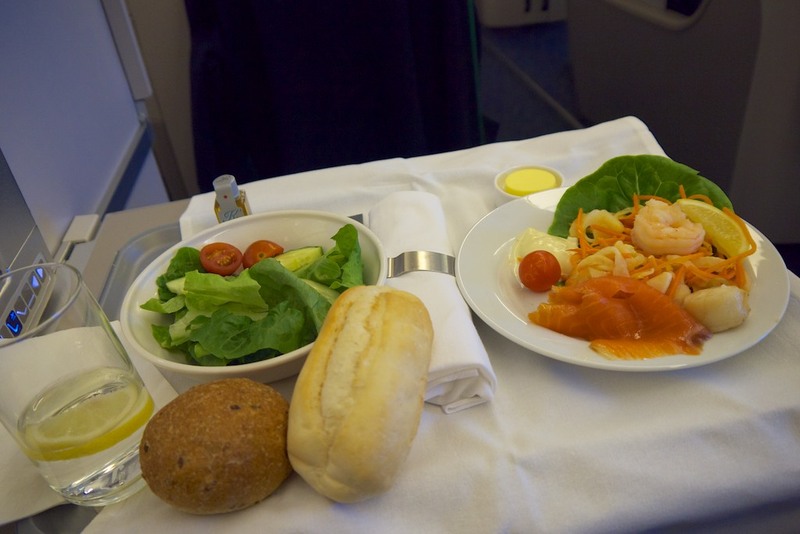 Note that if you are seated in the back half of the cabin, the first meal choice will often have already been taken by the time they get to you. To prevent this, you can pre-order your main course on some airlines. If you have been given pyjamas, changing into them before takeoff is a great time to do so. This is because you won’t have to wait for the seatbelt sign to be switched off after takeoff and you won’t get in the way of the cabin crew. When you come out of the bathroom, ask one of them to hang your clothes up for you. The industry standard for international flights in Business Class is a 1-2-1 configuration with lie-flat seats. That means that every passenger gets direct aisle access. Some carriers like Qatar Airways and Delta have upped the game with sliding privacy doors. On some international flights, you’ll find a different configuration, like the 2-2-2 with the excellent Apex Suites found on Japan Airlines, Korean Air and Oman Air. Not-so-great products are ones that do not provide direct aisle access to window passengers, like on LATAM and most international United flights. If you’re on a domestic flight in Australia—or any other country for that matter—chances are you’ll be flying on a Boeing 737 or Airbus A320. These planes usually feature recliner seats, which do not go flat. Try to avoid these aircraft on flights of over three hours. On bigger planes like the Airbus A380 and Boeing 777-300ER, Business Class is often split in two—one main cabin and one (mini) rear cabin. The latter is more intimate but also closer to the baby bassinets in Premium Economy or Economy Class located directly behind. You’ll need to weigh up that risk yourself. Before you dine, you’ll be offered another drink. This time it will definitely include alcohol (unless you’re flying a dry airline like Saudia). Often can take a while (up to or even over an hour) to prepare food, so make sure to eat enough in the lounge to tide you over. This especially goes in case of any delays on the tarmac, which are common at busy airports like Los Angeles and Hong Kong. You can expect a multi-course meal, often ‘curated’ by a famous chef, but the quality of food can vary widely. On most airlines, you’ll eat at the same time as the other passengers. However, on higher-service airlines such as Etihad, you’ll enjoy ‘dine on demand’, meaning you can eat when you want. You’ll enjoy a large touchscreen, with a wide range of Western and local movies and TV shows. You’ll usually have a remote by your side so that you don’t have to reach forward. You’ll also get a pair of noise-cancelling headphones to use during the flight (but not to take home). These can be of varying quality, so BYO just in case. If you need to be connected to the ground, Business Class passengers can often access it for free. However, there will often be a low data allowance, e.g. 20 MB. You can purchase more if you need to. You’ll have USB ports and power outlets at your disposal. If you feel like mingling with your travel companions, whether you know them or they are strangers, you can do so at the onboard bar. Onboard bars are mostly found on Airbus A380 superjumbos and are accessible to both Business and First Class passengers. Most airlines don’t offer pyjamas to Business Class passengers, but we’re spoiled to get them on Qantas (a crowd favourite) and Virgin Australia (my favourite). A nice touch is when slippers are included too. Depending on the length of the flight, you’ll most likely get an amenities kit. This will include useful items like a toothbrush, toothpaste, haircomb, eyemask, earplugs, mouthwash and moisturising cream. If you’re lucky, you’ll get a mattress pad, but they’re more common in First Class. It is more likely you’ll be given just one pillow and one blanket. You can ask for more, especially if the cabin isn’t full. It’s best to request these before takeoff. After dining, it is reasonable to ask the cabin crew to make up your bed—this is called ‘turndown service’. You’ll only find showers onboard Emirates and Etihad’s Airbus A380 aircraft and that benefit is strictly reserved for First Class passengers. After a possible second (or third) meal, depending on the length of the flight, a hallmark of great customer service is a personalised farewell from the cabin crew. Upon arrival, you’ll be the first to deplane (unless there is a First Class cabin) and you may be given as express pass for immigration and customers. Your luggage should be amongst the first to arrive on the baggage belt. The main aim of using points for travel in Business Class is to increase comfort. Having realistic expectations of your flight will help you to make the most of it and to request assistance when you can and need it, e.g. turndown service. If you have extra points and can afford a First Class redemption, then check out the guide below for a sneak peek into what it is like to fly in luxury. If you’re a newbie, which of the aspects above are you most excited about? Or, if you’ve already flown Business Class, how do the tips above compare to your experience?